Winnie came from Peace and Love Farms in 2013, and resided at Urban Acres Market for a year before coming to live with me. She is about 5 years old. 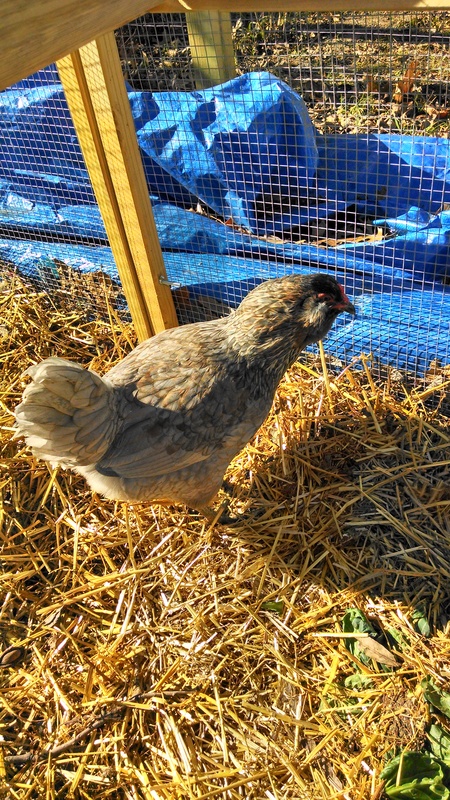 She is an Ameraucana and is anoble gray with a long neck. She is shy of people, and is the last to emerge when the greens (chard, bok choy or tatsoi), scratch, and chunks of pear have been spread out. She lays eggs with a tint of green. 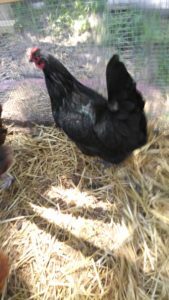 Mavriki is Greek for “little black one.” She is an Australorp with irridescent black feathers. She came to me as a peep in November of 2013. She lived at Urban Acres will late 2014 and then came to live with me. She was the one who noted, after the move, that they were in a different place and tried to alert the others, who were too busy pecking and scratching for grain. She alerts me to something that needs attention – like when another hen, Fancy Pants, got sick. Shen Fancy Pants the one who brooded eggs, died, Mav took over the task of brooding – trying hard to hatch that fake egg! She likes organic produce, and frozen peaches. Her eggs are brown. Aurie is an Ameraucana, and her eggs are blue tinted. She is the middle hen in the picture. She came to me as a peep in November of 2013 and was raised at Urban Acres, then came home with me in late 2014. She is pretty calm and lays throughout the summer, when other hens take a break. She delights in watermelon, and particularly frozen watermelon in the summer. Rosie is also an Ameraucana, and lays light rose-colored eggs. She is the hen on the right in the picture. She was also raised as a peep from November 2013 until coming home with me in late 2014. She gets her name because she was the one, from about 2 weeks of age, who was curious every time I went into the coop. She watched me and inquired as to what I was doing. She continues to do so to the this – she will watch me while others are indulging in the goodies I bring. She, along with the others, love the heads of broccoli. 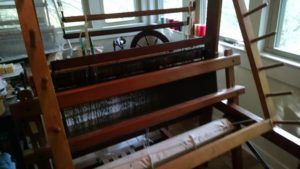 A note in memoriam – the hen at the left of the picture was Ginger. She is recently deceased. She was the Rhode Island Red, and was head hen. RIP, Ginger. Posted in araucana, backyard chickens, chicken flock, chickens. 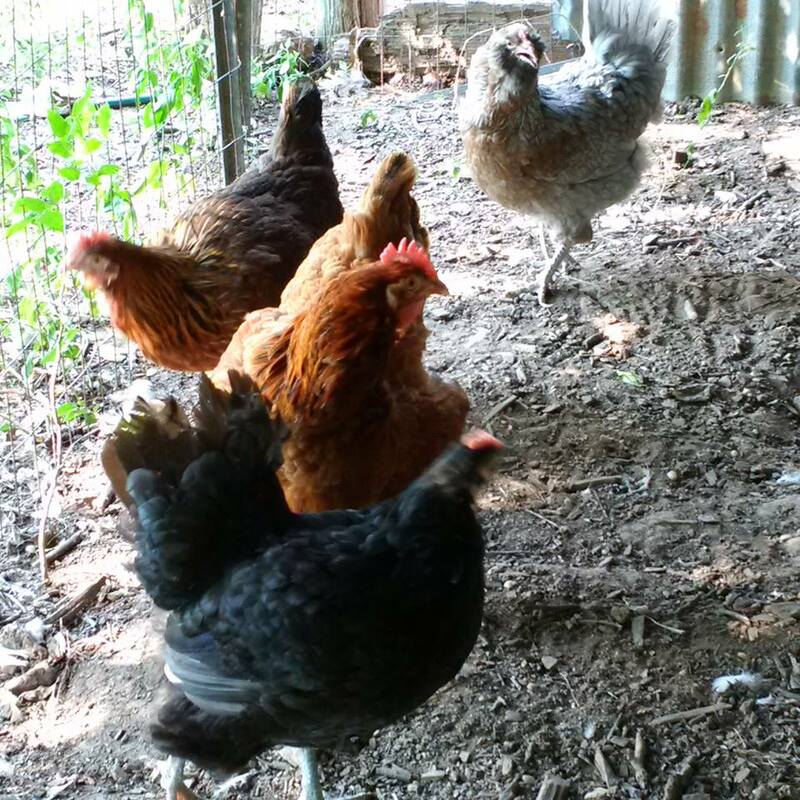 I am owned by five hens – three Ameraucanas, one black Australorp, and one Rhode Island Red. The youngest are now about 3 years old, the oldest, one of the Ameraucanas, is about 4. But all still lay at some rate or another. 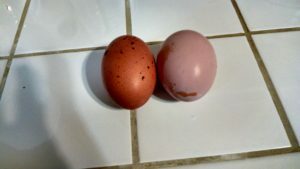 I noticed, however, that two were laying pretty regularly in December – Auri (blue eggs) and Ginger (brown eggs). 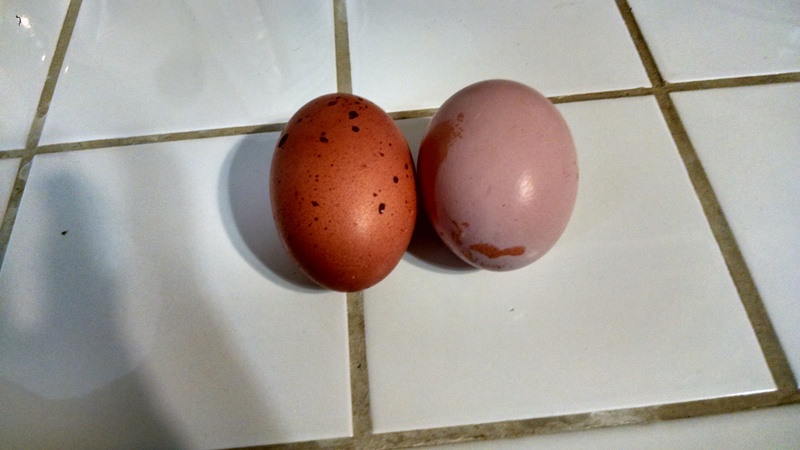 But in January two others took up the torch while the others took a break – Mav (brown eggs with deep brown speckles) and Rosie (pinkish brown eggs). In fact, Mav and Rosie are still laying as I write thise. HOWEVER, the other day, Mav’s egg was rather odd – as you see in the picture. You will note that the egg on the left is the size of a marble. This is not something Mav had laid before. It was perfectly formed, and had that speckled look just like her regular eggs. 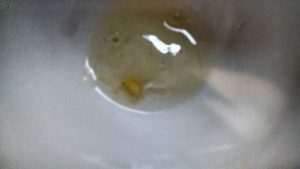 So I cracked it open to see what was inside, and i t appeared perfectly normal, with a small, almost forming yolk. The white had a good consistency. It’s hard to see – I cracked it into a white bowl, and a light keeps reflecting on it. 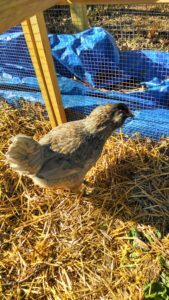 I asked my local chicken expert and he said – it just happens sometimes! Doesn’t indicate anything is wrong. 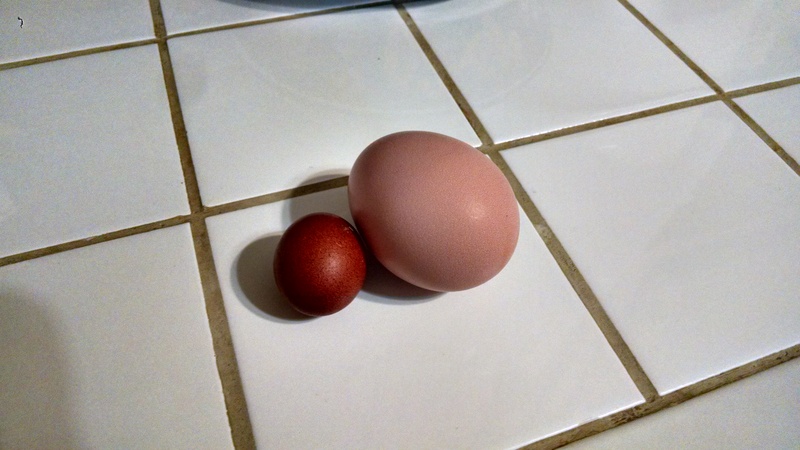 In fact, the next day she laid an egg that was perfectly normal, so I guess all is well in the coop. One thing that must be remembered – chicks often take a break over winter or when the weather is wonky like we have had lately here in Dallas. Or when they are molting, or move, or otherwise their world is disrupted. But usually egg laying subsides markedly in the winter. And then … Groundhog Day comes … and the laying starts picking up. It’s really not magic, and don’t go looking for a calendar in the coop, where the hens are keeping track of the days. It all has to do with the length of the day – the number of hours of daylight. As the daylight increases, so does laying. So… keep those hens happy and enjoy the eggs! Posted in backyard chickens, chickens, egg laying, eggs. 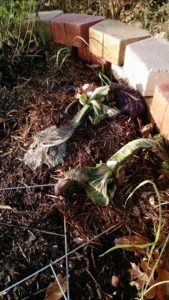 I do not ordinarily do anything out of the ordinary to keep my plants from succumbing to freezes – I prefer to “experiment” and observe which ones make it through light and hard freezes and which do not. Prior to the first hard freeze, in early December, I had harvested most of my red mustard, green mustard, and broccoli raab. 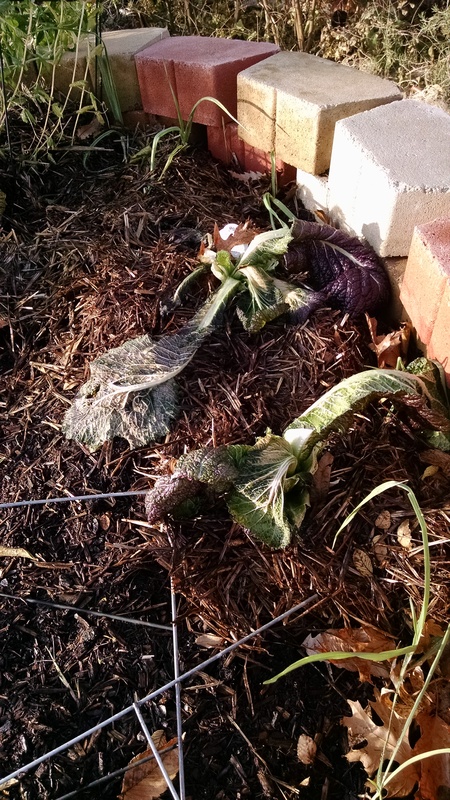 Good thing – they did not survive the hard freeze. Here’s a look at my mustard after the freeze. Only the chard managed to come back (but then, chard is VERY resilient). 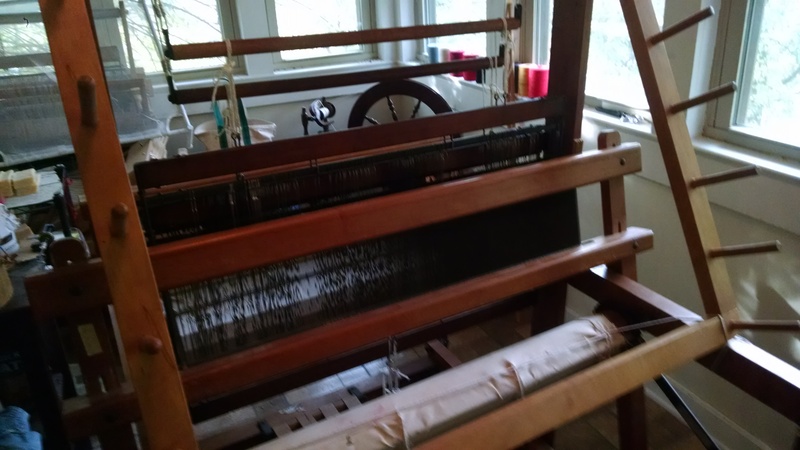 Also weathering the freeze was the sorrel, as well as my radiccio. Of course, the kale made it through (although I’d mulched it just in case), and carrots. Posted in carrots, chard, freezing weather, garden, mustard. I must say, we urban chicken wranglers do get attached to our chickens. Especially if we have raised them from mere day-old chicks. I had what could only be a “mom moment” a couple of weeks ago. 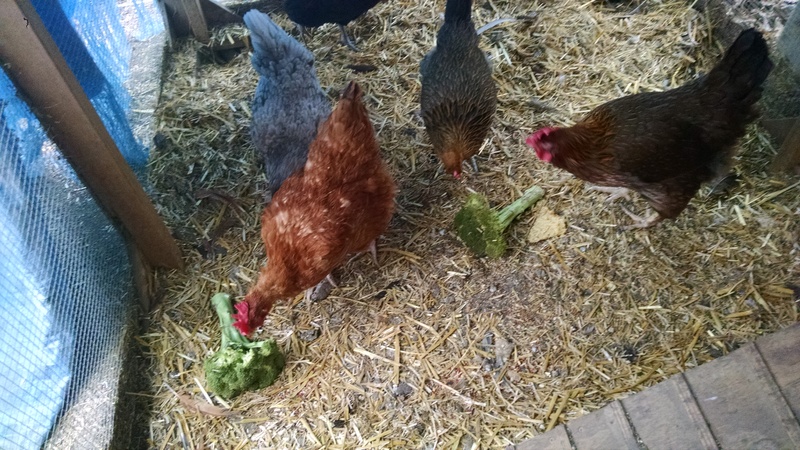 I had tossed out to the hens some broccoli that had been in the refrigerator a bit too long. 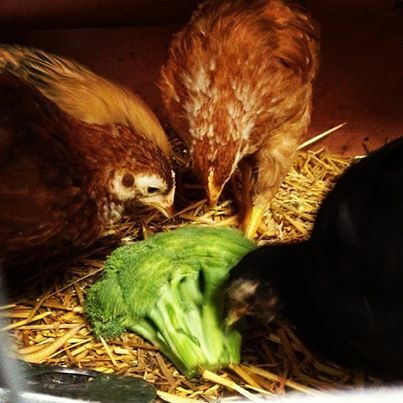 As these 3-year olds attacked the broccoli, I had a flashback to when they were mere chicks and were attacking a broccoli floret I had given them. That’s Mav (for Mavriki), Rosie (Nosie Rosie) and Ginger (Georgia Ginger) going at the broccoli pecking away. 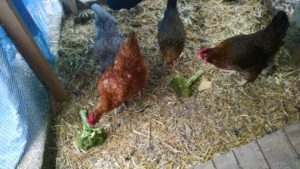 Now let’s look at them in January 2017….. Mav and Aurie (Ameracauna – she was outside the previous picture) as well as Ginger heading for the broccoli. The gray lady is Winnie, another Ameracauna who is almost a year older. I got her as a laying hen. Posted in backyard chickens, chickens, chicks. Well, all I can say is it’s about time! Usually we get our first freeze the third week in November, and now here it is the second week of December! So what to do to prepare? I’ve been out today, getting my garden, chickens and faucets ready for the next three nights which it’s going to dip way below freezing. First, I made sure the chickens have some additional straw in their coop. No, I don’t really worry about them keeping warm unless it dips into the ‘teens. They have down and feathers and fluff up rather nicely in the cold, and do quite well. (Our comforters have down in them, remember?) I also gave them an extra ration of corn late this afternoon. The carbohydrate helps them get the body fires going and helps keep them warm. The garden? 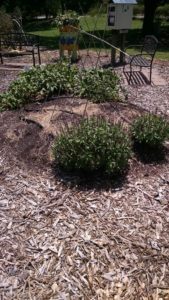 I mulched with some old straw around the plants that may have a hard time. I’m generally of the attitude that if a plant can’t handle it, then I’m not going to worry. 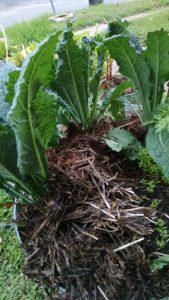 Like chard, that can have ice on it, wilt a bit and come back within a day or two in the thaw. But my kale, mustard, broccoli raab and peas, now that’s another story. 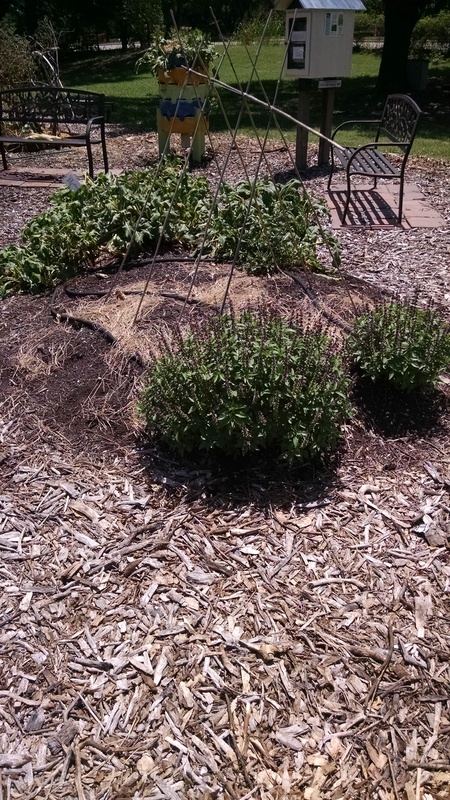 You can see the kale all mulched up in the picture. I gave the plant feet a nice 3″ of straw on the ground. I didn’t have to water, because the rains during the last few days took care of that. 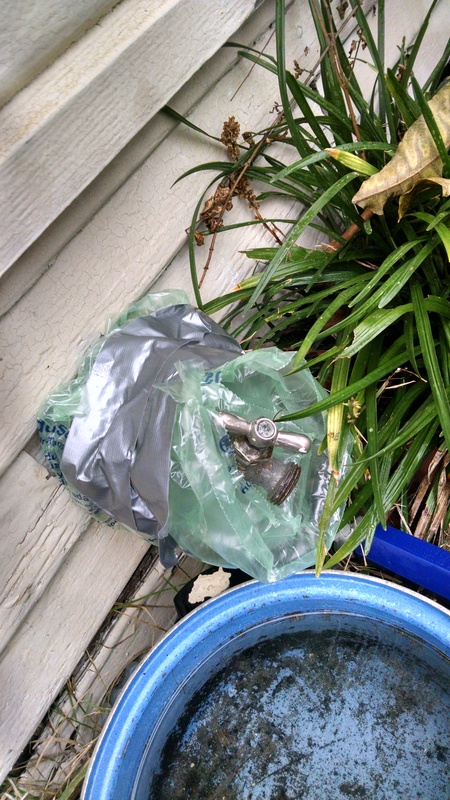 Now… the hoses and faucets. 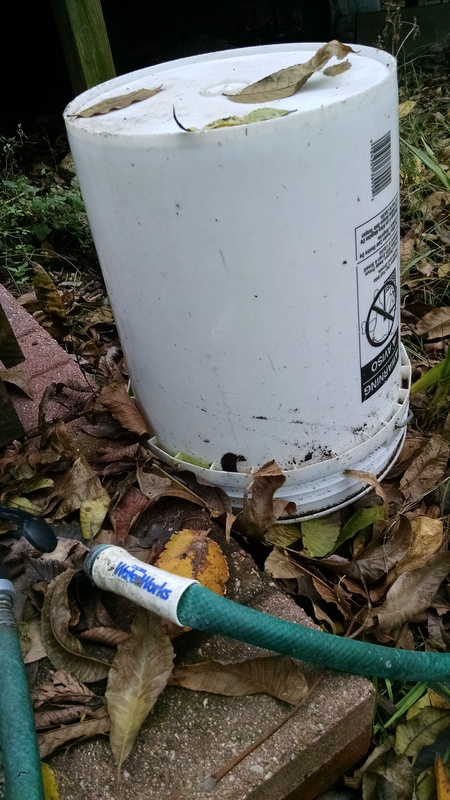 I disconnected both garden hoses. Then I covered the faucets. The one in back, that sticks straight up I covered with a 5-gallon bucket. The one in front, coming out the side of the house skirting I wrapped with bubble wrap and duct tape. That worked last winter quite well. Posted in chickens, freezing weather, garden. 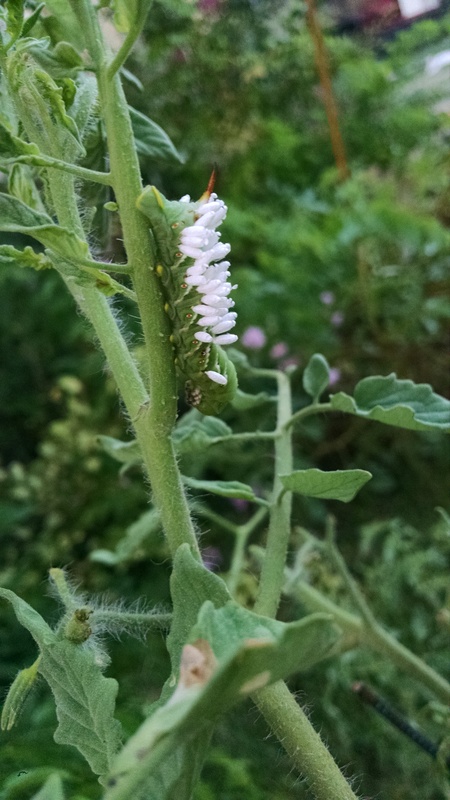 I was examining the tomato vines that seem to be everywhere, and found … my very first tomato worm … EVER! I’ve always planted marigolds and basil with my tomatoes, but this year those plants got overrun with the tomato vines. I was concerned at first, but then noticed that the worm was covered with wasp larvae. They will take care of the worm. Nature taking its course. At the Dig Deep growers conference in Fort Worth this past weekend, I re-established contact with the organizers of the Community Harvest garden in Plano. 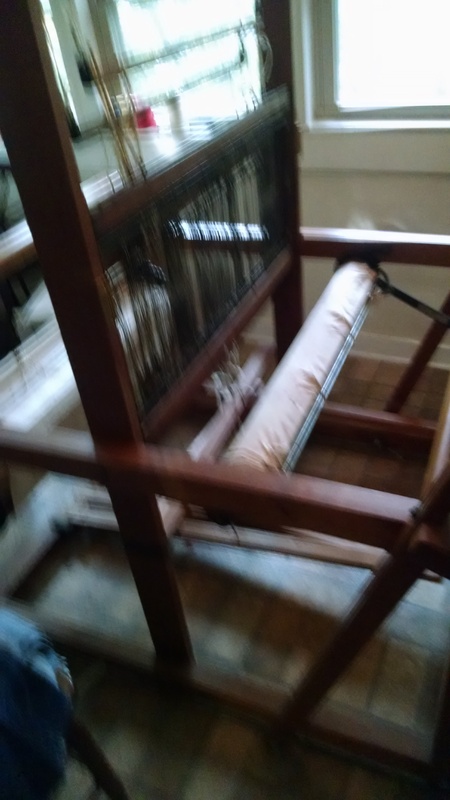 I visited on Sunday, and took a tour. Of note was a hugel kultur bed that is about 3 years old, and going strong. My tour guide mentioned that the bed was placed flat on the ground, and that next time they would dig a trench in which to place the wood branches that form the base component of the bed. Posted in hugelkultur, pests, tomato worm, tomatoes.